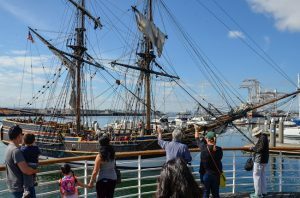 Oakland, Calif. – October 10, 2018: Tall Ship Lady Washington will be docked at Jack London Square at the foot of Broadway, Saturday and Sunday. Visitors can experience maritime history by taking a vessel tour for a small donation to the floating museum. There are also ticketed sailing trips on San Francisco Bay. Schedule for Oct. 13 and Oct. 14: Vessel Tours are 10 a.m. to 1 p.m., adventure sails are 2 p.m. to 5 p.m. The ship’s crew provides a variety of hands-on educational experiences. For tickets please go to the Grays Harbor Historical Seaport Authority website. Transportation options to Jack London Square include AC Transit, the Alameda/SF Bay Ferry, Amtrak, biking, walking and driving. For directions to the Oakland waterfront, please go here.